5th Annual IoT Day Celebrated in an IIC-organized 24-hour Tweet Chat Marathon. 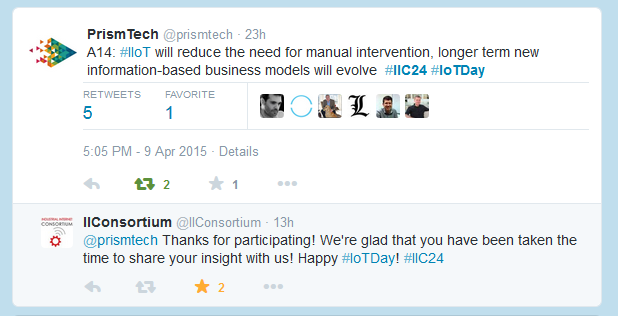 PrismTech participated in a Tweet Chat to celebrate the annual IoT Day organized by Industrial Internet Consortium (IIC) on 09 April 2015. The event started at 9.00pm ET (1.00am UTC) with IIC member companies, IoT developers, analysts and enthusiasts tweeting their insights and updates about the Internet of Things for the whole 24 hours using hashtags #IIC24 #IoTDay. Security, innovation, government’s role, value creation, IIoT adoption and its drawbacks are amongst many topics discussed. While healthcare, self-driving cars, smart factories, smart grids and home automation are unanimously recognized as areas where the IoT has found a need, innovations such as smart welding, tyres with sensors, solar-powered beacons, aquatic robots and connected cows were highlighted as exciting new IoT application domains. During the discussion, it was agreed that IoT adoption is becoming widespread and gaining momentum all over the world, already transforming many businesses and organization through improved operational efficiency, better networking capabilities; providing a new arena for innovation and powering the rise of the Data Scientists. Security and Interoperability emerged as key IIoT challenges that need to be addressed with some urgency. Lots of excellent insight on how to address the risks for companies looking to invest in the IIoT emerged, such as utilizing open, agile, flexible and updatable platforms; and transparency of data ownership and usage. While there were common agreement that the government could play an important role, the day also highlighted the massive amount of effort that the IIC has done and encouraged them to continue to raise awareness & collaboration among companies, build consensus, create trust, recommend standards, ensure interoperability, and enhance credibility. 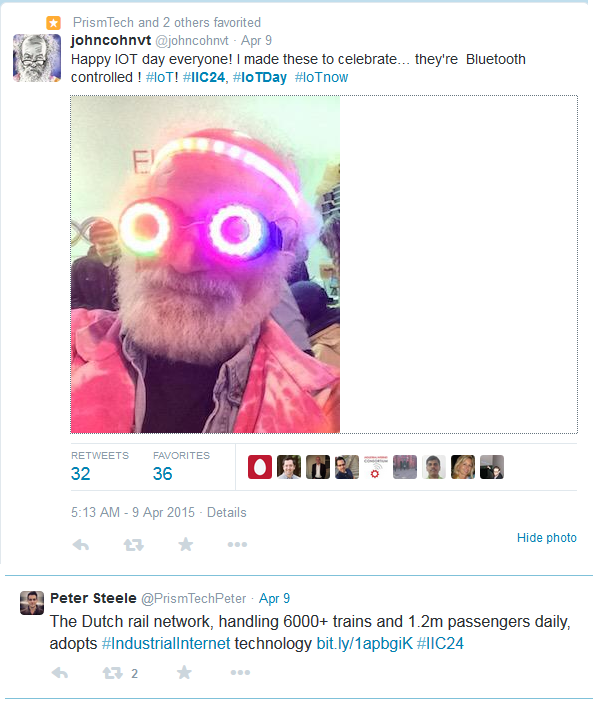 “It’s been an epic #IoTDay! Busy as bees sharing experiences & inspired by the discussions. Thanks! #IIC24 #IntelIoT” says David McKinney, Marketing and Media at IntelIoT. As the clock had its final tick, IIC concluded the “insightful” IoT Day had been a big success.